KNOXVILLE, Tenn., April 15, 2019 /PRNewswire/ -- Regal is egg-cited to announce the launch of a weeklong, nationwide Easter egg hunt beginning Monday, April 15, that will bring blockbuster movie posters to life. 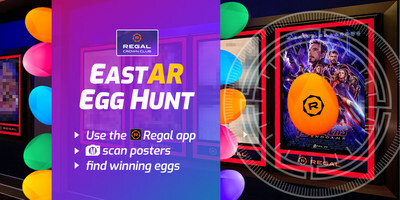 Movie fans are invited to use the Regal mobile app's augmented reality filter to scan in-theatre posters and unlock exclusive rewards, redeemable through Tuesday, April 30, at all participating Regal theatres. "The race is on for our moviegoers with this one-of-a-kind promotion, which features incredible prizes hidden in posters of the year's most anticipated movies," said Chris Sylvia, vice president of media at Regal. "With the rise of augmented reality, we strive to stay on the forefront of cutting-edge technology to give our guests unbeatable entertainment experiences, as well as reward Regal's loyal moviegoers." Easter eggs will be hidden inside different movie posters at participating Regal theatres. To discover the hidden rewards, open the Regal mobile app, then click on the camera icon in the top-right corner of the home screen. This will open an augmented reality platform that, when aimed at the correct poster, will reveal the hidden egg and its associated prize. Moviegoers have the chance to win a variety of exclusive prizes, including free popcorn, bonus Regal Crown Club credits and 25 percent off an entire credit order in the Regal Reward Center. Supplies are limited so movie enthusiasts are encouraged to download the latest version of the Regal mobile app to let the hunt begin. For additional details, please visit: www.regmovies.com/static/en/us/promotions/ar-easter-egg-hunt. Through the industry-leading Regal Crown Club, millions of active members accumulate credits at the box office and concession stand to earn rewards including free popcorn, soft drinks and movies. Moviegoers can also stay up-to-date with Regal and theatre happenings through the award winning Regal mobile app (23rd Annual Webby Awards, Webby Honoree in "Apps, Mobile, and Voice: Best Practices"). Moviegoers can program their favorite theatres and purchase tickets all from their mobile devices. Free membership is also available online at www.regmovies.com/Crown-Club. Regal, a subsidiary of the Cineworld Group, operates one of the largest and most geographically diverse theatre circuits in the United States, consisting of 7,216 screens in 551 theatres in 43 states along with American Samoa, the District of Columbia, Guam and Saipan as of March 31, 2019. We believe that the size, reach and quality of the Company's theatre circuit provides its patrons with a convenient and enjoyable movie-going experience. We are committed to being "The Best Place to Watch a Movie!" Additional information is available on Regal's website at www.REGmovies.com.